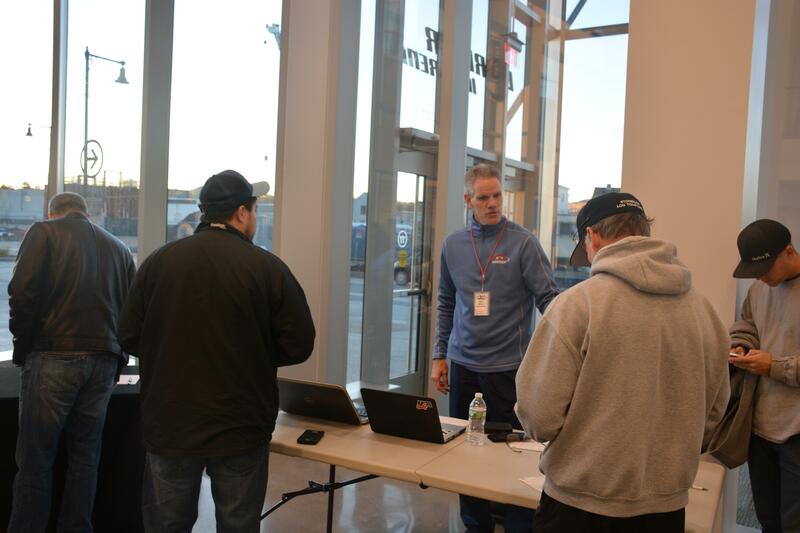 USA Hockey Coach-in-Chief of Massachusetts Paul Moore checking in coaches at the 2016 Bruins Coaching Symposium at Warrior Ice Arena. In some ways, Paul Moore’s coaching career began by happenstance. After his playing career, which took him from Falmouth to ECAC championships at UMass Dartmouth (then SMU) and all the way to the IHL with a few New York Rangers training camps along the way, he returned to the Cape to work for his family business and coach some hockey with the Clippers and his legendary former coach Buddy Ferreira. But to hear him tell it, Moore had always enjoyed teaching. As a high school player, he was working with learn-to-skate programs. And he admits he may have missed his calling as a teacher. All these years later, however, after 24 years on the bench with Ferreira and another six a the head coach at Falmouth himself, Moore has made coaching his life’s work in so many other ways. Back in 2005, Moore was asked to serve as the “ACE” coordinator in District 5, hosting coaching clinics, and things took off from there. “I eventually bothered the guys at USA Hockey enough to get a clinic in Falmouth,” he says. “So I started doing my own clinics in Falmouth back in 2008, and I started speaking at all of them. One thing led to another and here I am the Coach-in-Chief. Many initiatives have come to USA Hockey over the past few years, the American Development Model chief among them, along with taking checking out of 12U, the latter of which Moore says may be misunderstood. The curriculum is also changing with the times. On the immediate horizon, Moore is looking forward to the 2018 Bruins Academy Coaching Symposium. Which includes almost 300 coaches earning their Level 2 & Level 3 clinic certification and listening to the Bruins staff speak before Bruins morning practice. Moore will have another excellent lineup at the USA Hockey Level 4 Coaching Seminar, including speakers like Babson head coach Jamie Rice and UNH associate head coach Mike Souza. He’s also bullish on the future of coaching programs both at the national and at the local level. Not only is Moore bullish on the future of coaching education, but also on one of the more ambitions initiatives in USA Hockey history. It’s called “51 in 30.” The goal? To have 51 percent of the minutes played in the NHL and NWHL played by Americans by the year 2030.